This evening of medieval theatre, the first of three, was created by Robert Cohen and Edgar Schell as part of the three-year, funded Focused Research Program in Medieval Theatre during the late 1980s. 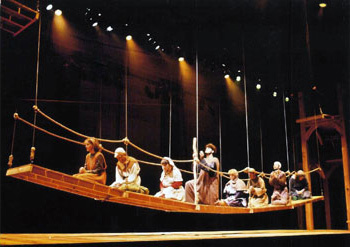 In all, 21 plays originally written for Corpus Christi festivals in England during the fourteenth and fifteenth century were adapted and produced on the stage over a period three consecutive summers, and one (The N. Towne Passion) was made into a professional video under a major grant by the National Endowment of the Humanities. The first of these compilations, subtitled The Beginnings and translated by Cohen, include the individual plays: The Creation of the Universe and Fall of Lucifer, The Creation of Adam and Eve, The Fall of Man, The Expulsion, The Murder of Abel, Noah, and Abraham and Isaac. It is published in Cohen, Eight Plays for Theatre (McGraw-Hill). Performance rights available from the author.